Commercial and residential bark blowing services from Mike Lynch Enterprises provides instant beauty and gratification for home and business owners looking to spruce up their property quickly and cost-efficiently. Bark blowing services installs a smooth, even layer of high quality bark anywhere on your property you desire. Mike Lynch’s commercial and residential bark blowing services can make shrub and flower beds stand out and provide a beautiful backdrop to virtually any landscaping. Whether it’s a new installation or just freshening up an existing bark bed, bark blowing services from Mike Lynch Enterprises provides the highest-quality bark mulch products in this area. Professional commercial and residential bark blowing services from Mike Lynch Enterprises ensures that your bark project will look its best. Their bark blowing services crew have the experience and equipment to get to hard-to-reach places and provides excellent clean up after bark blowing. The bark products used by bark blowing services is kid safe and pet friendly. Mike Lynch Enterprises provides bark blowing services and other central Massachusetts cities and towns. Commercial and residential bark blowing services can be used for properties large and small – from single homes to business parks, municipal properties, and commercial developments. 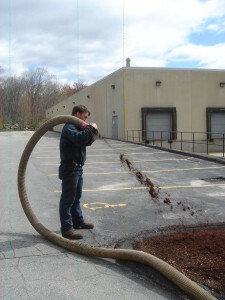 Standard bark blowing services equipment can blow bark into areas up to 200 feet from the service truck. If you’re considering contracting bark blowing services or one of the surrounding communities, talk to Mike Lynch Enterprises first – they’re the commercial and residential bark blowing services leader.